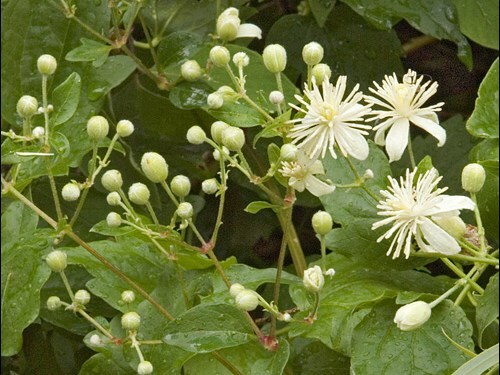 Clematis vitalba (old man’s beard) is a vine (family Ranunculaceae) with white flowers and oval-shaped leaves found in the central coast ranges of California. It is native to the United Kingdom. It favors forests and woodlands. It spreads via seeds and roots. Means of dispersal include water, wind, humans and animals. The Plant List - Global taxonomic resource and collaborative clearinghouse from Kew Gardens, the Royal Botanic Gardens, the Missouri Botanic Garden and others. GBIF - Global distribution information.